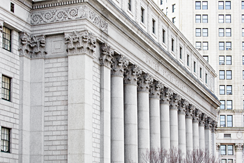 A common charge used in the criminal courts of New York is Disorderly Conduct, Penal Law Section 240.20. Disorderly Conduct is legally a violation, not a crime. This means that a plea of guilty to Disorderly Conduct is not a criminal conviction. A violation of Disorderly Conduct involves behavior, “with intent to cause public inconvenience, annoyance or alarm, or recklessly creating a risk thereof.” A police officer will charge someone with Disorderly Conduct for things such as excessive noise, threatening behavior, using obscene language or blocking a sidewalk or street. The person charged will typically receive a pink document called a summons; it informs the person of the violation as well as the date they must appear in criminal court to defend themselves against the charge. Before your court date you will have the opportunity to get a defense lawyer to help you with your case. The maximum penalty for Disorderly Conduct in New York is 15 days in jail and several hundred dollars in fines and surcharges. While these are not particularly harsh punishments, they are enough that you should take the charge seriously. Because Disorderly Conduct is a violation and not a crime, a plea or verdict of guilty to Disorderly Conduct will not result in a criminal record. There are exceptions, however, such as in situations where prosecutors demand a “waiver of sealing.” It is important to consult with an experienced criminal defense attorney to determine whether a Disorderly Conduct disposition is right for you. Only an experienced attorney will be able to analyze all potential consequences of a Disorderly Conduct disposition and help you figure out if such a disposition will cause problems for you in the future. Individuals with immigration concerns should make absolutely sure that they discuss the ramifications of any disposition with an attorney. It is important to note that you should never make the mistake of blowing off the mandated court appearance. If you fail to appear on the appointed date, the judge will issue a warrant for your arrest. You never want to find yourself in a situation where a relatively minor violation for Disorderly Conduct escalates to the point where you are arrested and booked into jail. Having an attorney handle a summons like Disorderly Conduct is more than just having someone appear in court. An attorney will be able to explain terms and procedures and guide you through the process. He will dispel the uncertainty and anxiety that comes with dealing with the criminal justice system. And an attorney will be able to fight for you, to get the absolute best result that can be had. In fighting the summons, an attorney will be able to assess the court copy of the summons. This copy includes the officer’s reasons for issuing the violation. This information can help your lawyer mount a targeted defense that will give you the best chance for a positive outcome. Your lawyer may even be able to get the case dismissed if the officer’s reasons for issuing the summons are deemed insufficient. If the case cannot be dismissed, your attorney can negotiate a settlement to resolve the matter. Your lawyer will try to convince the judge that you are a decent, upstanding citizen who can be let off with what’s known in New York as an Adjournment in Contemplation of Dismissal (ACD.) This is a negotiated settlement between your lawyer, the prosecutor and the judge. Under an ACD, you maintain your innocence and essentially promise to stay out of trouble. An ACD will lead to a dismissal of your case after a certain period of time, usually six months, as long as you stay out of trouble. You might be tempted to simply plead guilty to the Disorderly Conduct violation and accept the punishment, but a defense lawyer will explain that there really isn’t a good reason to plead when there are options such as the ACD. This is why it is important to talk to a lawyer who can advise you how to handle your case before you have to appear in court. If you receive the summons in Queens, Brooklyn, Manhattan, Staten Island, or the Bronx, it is important to get a Brooklyn Criminal Attorney who has experience handling disorderly conduct so your case will be handled conveniently and effectively. Having a champion of the courtroom on your side is a must if you are facing Disorderly Conduct charges, or any other criminal charges in New York. Ensure that you have a winning team on your side by contacting The Law Office of Mahmoud Rabah. Utilizing his knowledge and expertise over a range of criminal charges in New York, Mr. Rabah is able to fight for your rights and protect your innocence every step of the way, sometimes without you even stepping a foot into a courtroom. Don’t leave your reputation at risk, contact the Law Offices of Mahmoud Rabah today and start the fight for your freedom.